Putting together a diversified investment portfolio can be uncomplicated and performed in the solitude of my home. I can use online tools provided by brokerage firms to quickly build investment portfolios. These tools don't substitute for customized investment recommendations. The portfolios suggested may or may not be suitable for specific objectives. And, though they're typically diversified portfolios, diversification doesn't protect against loss all the time or guarantee a profit. But they're free to use and they can offer insights into how a portfolio is constructed. To start the process of getting a portfolio recommendation at Vanguard, visit the Mutual Fund Recommendation page or the ETF Recommendation page. Get there by visiting Vanguard (Personal Investor's section) and navigating to Investing >> Investment Products >> Advice & tools to help you decide >> Online recommendations >> Build a mutual fund portfolio or Build an ETF portfolio. The underlying investments to achieve this allocation in mutual funds consisted of Vanguard Total Stock Market Index Fund, Vanguard Total International Stock Index Fund, Vanguard Total Bond Market Index Fund, and Vanguard Total International Bond Index Fund (all Investor Shares). For an ETF portfolio, suggested investments consisted of Vanguard Total Stock Market ETF, Vanguard Total International Stock ETF, Vanguard Total Bond Market ETF, and Vanguard Total International Bond ETF. To build investment portfolios at Schwab, visit the Personalized Portfolio Builder. Navigate to Research >> Mutual Funds >> Mutual Fund Portfolios; Research >> ETFs >> ETF Portfolios; or Products >> Portfolio Solutions >> Build a diversified portfolio of mutual funds or ETFs >> Schwab Mutual Fund Portfolio Builder – Launch or Schwab ETF Portfolio Builder – Launch. Then, specify goals for the portfolio. My choices ranged from a conservative portfolio with income stability and capital preservation to an aggressive portfolio designed for growth and value for an individual with a high risk tolerance. After accepting this allocation, I was prompted to enter a specific investment amount (the suggested minimum was $5,000). For each asset type (large cap, small cap, etc. ), I received a menu of investments from which to choose. For the ETF portfolio, my choices included Schwab U.S. Large-Cap ETF, Schwab U.S. Small-Cap ETF, Schwab International Equity ETF, and Schwab U.S. Aggregate Bond ETF. Mutual fund choices included Schwab Core Equity Fund, Schwab Small Cap Index Fund, Schwab International Index Fund, and Schwab U.S. Aggregate Bond Index Fund. Pertinent information about each ETF or mutual fund was presented, such as its commission-free status and expense ratio. Upon choosing my ETFs or mutual funds, I viewed how my portfolio aligned with the model portfolio. 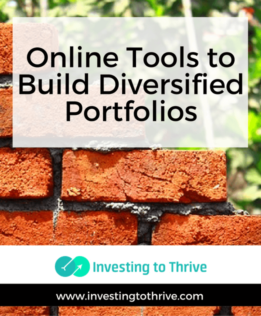 Portfolios built with online tools offered by Vanguard and Schwab don't incur asset under management (AUM) fees, unlike most portfolio services offered by robo-advisors and brokers that sell managed portfolios. However, by avoiding the fees, I also skip the value-added services. I'll need to manage and re-balance the portfolios myself to maintain the desired asset allocation. Still, these tools show the basics of model portfolios and make it easy to get started with investing.